As the light slowly faded at the end of the day, I hung around this little park. There was just a great mix of people around, toddlers, teenagers, adults, old folks, the weather was great, and I enjoyed the mood. I saw this old man ambling through the park, pushing his cart, stopping, watching, resting, and walking some more. As he parked it here, in front of a small pool of water, I thought I’d take some photos. Then this dog that had been hanging around walks into the frame, and I stopped shooting, waiting for it to leave. However, the dog suddenly stops into the pool for a drink, and I thought ‘there’s a cool picture‘, so I shot this. 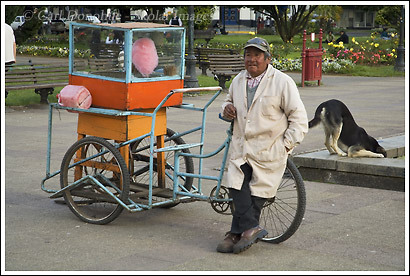 There was something about the old man that had so much character.To see him selling candy was kind of odd – it was an interesting association, an, his weathered features and child’s candy. I enjoyed the town of Osorno. I would like to go back and spend some more time in the town, visiting the parks, walking the streets, watching the people, and hanging out. Hopefully my travels will bring me back to this part of the world, and I’ll get to photograph the area in more depth. This entry was posted in Chile, People, Travel on April 25, 2007 by Carl D.